The Finest Hours of WWII takes viewers to the front lines of the European, the Pacific and the African theatres of the deadliest conflict in human history. This is a 21 episode collection containing historical footage. Combat Aircrafts follows the history of the aerial assault vehicle from the creation of the aero plane to its militarization during World War I and the Russian Revolution. With narration over some incredible archival footage, this 5-part series is a complete historical overview from 1900 to 1945. Waves of Freedom is an adventure documentary that recounts a post-war story of U.S. volunteer sailors recruited to break the British naval blockade of Palestine. 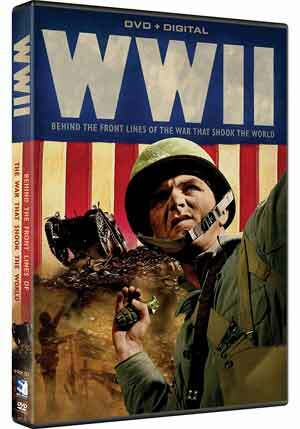 Quick Hit Review: I enjoy learning just about anything on World War II as there are so many stories and viewpoints spanning across continents and countries, from the invasion of Europe and their attempts to hold Germany back to the United States’ involvement following the bombing of Pearl Harbor. Add in the brutality and loss of life, both by soldiers and the innocent people Hitler and his goons had murdered, it was a fascinatingly dark time of human history. Also interesting is just how on the edge of a needle the war turned in favor of the allies, but one wrong turn and this would certainly be a different looking world. Now, in terms of this set, I don’t think it’s as well put together compared to the documentaries from The History Channel and the like, but there is some nice information presented here and spans some interesting topics and combined with the narration set over archive footage, it is a good history lesson that with more interviews from experts could’ve taken this over the top. As it is, not bad and if you hold any interest in the war, this is well worth watching. This 6-disc set is housed in a standard sized DVD case. No features were included but inside is a Digital Copy code which is only redeemable on Mill Creek’s website. Each episode is presented with a full frame 1.33 aspect ratio and as one would expect, doesn’t always look the best since the bulk of these are old archive footage; still not bad. The Dolby Digital 2.0 track meanwhile is about the same, rather serviceable and the narration comes through with good clarity. Overall, WWII: Behind the Front Lines of the War That Shook the World might not be the best documentary sets out there about the war, yet there is some great information to glean from this and it utilized the archival footage quite nicely. This DVD set has adequate audio/video transfers and also doesn’t have any bonus features.